Discounts begin at 5 Quarts or 5+ 1 pound pouches. See below. 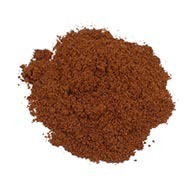 Note: Our ground cloves have a high oil content which sometimes causes plastic containers to slightly haze. Description Cloves are the unopened flower buds of an evergreen tree, boasting a pungent, woody, sweet and almost peppery flavor that pairs well alongside sweet and savory cuisine. Whole high quality cloves for your best cooking and baking! Whole cloves are the dried unopened bud of an evergreen tree in the Myrtle family. Whole cloves are brown and resemble a nail with a large rounded head. Cloves can be used either ground or whole. Typical uses include studding oranges during holidays, in mulled beverages, in many baked goods. Store cloves in a cool, dry place, away from heat and light for best flavor retention. Whole cloves do retain flavor for a longer period of time than ground cloves. Combine first 4 ingredients and cook. Score ham and stud with cloves. Place, fat side up, on rack. Bake at 325 degrees uncovered until the internal temperature reaches 140 degrees; basting every 15 minutes. Clove Tip!! Add a pinch of ground cloves to apple pie for added flavor. Pour apple juice/cider into a large stainless steel pot (crock pots or slow cookers are best but not necessary). Place spices and peels into a cheesecloth. Drop cheesecloth into apple juice/cider.In a regular pot: heat to just short of a boil. In a crock pot: Heat for 2 hours. Remove cheesecloth. Once you are done, you can keep the stove-top on warm and have people ladle the apple cider straight from the pot. You can also float some thinly-sliced orange and/or lemon slices on top of cider mixture for extra flavor. In saucepan, combine 1/3 cup sugar and cornstarch; gradually stir in milk and cream until smooth. Bring to boil over medium heat; cook and stir 2 minutes. Remove from heat. Gradually add a small amount of hot mixture to egg yolks; return all to the pan, stirring constantly. Cook and stir over medium low heat for 15 minutes until it thickens slightly, do not boil. Stir in vanilla. Pour into bowl; place plastic wrap on top pressing to cover surface of sauce. Refrigerate. In large bowl, combine 6 cups water and 1 tablespoon lemon juice. Peel pears, leaving stems. Plunge pears into lemon water. In saucepan, combine lemon peel, remaining sugar, water, and lemon juice. Bring to a boil; add cinnamon stick, cloves, and pears. Reduce heat; cover and simmer for 20-25 minutes or until tender. Carefully remove pears to a plate. Discard cinnamon stick and cloves. Drizzle syrup over pears. Loosely cover and refrigerate 2-3 hours. Place pears on individual serving plates; drizzle with vanilla sauce; garnish as desired. Cut tops from beets, leaving a 1 inch stem. Cook in boiling water to cover 30 minutes or until tender. Drain, reserving 3 cups liquid. Pack beets and sliced onion into hot jars; set aside. Place whole cloves in a 6 inch square cheesecloth and tie with string. Bring 3 cups reserved beet liquid, spice bag, cinnamon sticks, and remaining ingredients to a boil in a Dutch oven. Remove and discard spice bag and cinnamon sticks. Pour hot mixture into jars, filling to within 1/2 inch from top. Remove air bubbles, and wipe jar rims. Cover at once with metal lids; screw on bands. Process in boiling water bath 10 minutes.